← The trouble with England. Posted on April 10, 2013, in General and tagged Borussia Dortmund, Champions League, Dortmund Champions League, Dortmund comeback, Malaga. Bookmark the permalink. 45 Comments. Come back to the Bluebirds Ben…..we’re Cardiff City and we’re going up!!! Ah thank you Norbert, Wikipedia let me down on that one! I’ll change it now. People who don’t watch football normally only see the negative headlines about how much money players make or the rare occasions of racism. If they experienced something like Tuesday night in Dortmund, it would surely change their mind forever. I can’t think of anything else in the world which can produce such emotions. I’m very jealous you got to stand on the Sudtribune for that game, it’s surely the best section of a football stadium in the world. I wrote about when I stood on there for Wolfsburg elsewhere if you didn’t read that yet. Rubbish! I find football incredibly boring, simple as. No game will ever change that. You’re obviously watching the wrong games! I hope you’re both joking, otherwise you’re extremely ignorant people. You’re a strange chap Leon. Why would you come on to a football website to read about football, then be surprised when people like football? I’m not surprised that people like football, what on earth gave you that idea? I have told you that I don’t like football and never will. If after 33 years I still find that I detest the game, for many reasons, I very much doubt one game would make me change my mind. That’s what I have said. You’re obviously thick as well as ignorant. August 24, 2012I went here when I was 12, and have always rrmembeeed the awestruck feeling I felt. I recently went back after 38 years, and was just as impressed now as I was way back then. A truly unique site, and well worth the short detour from Sevilla/ Malaga/ Gibraltar! Thank you for these great photos. 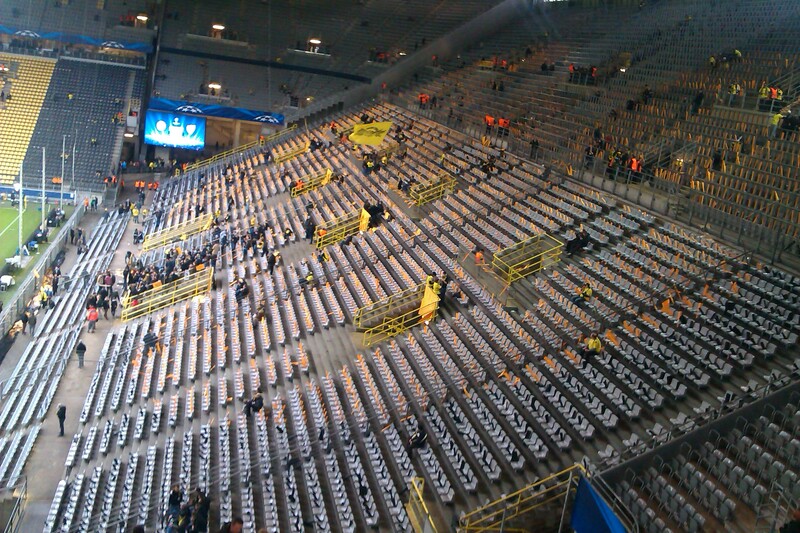 I’d not seen the slot-in seats in the Suedtribuene before. I lived in NRW for 5 years and have been to the Westfalen now over 50 times (inc. season tickets in the centenary season). Now back in the UK, I ensure I get back at least once a season. You’re absolutely right: it is THE No. 1. By a long way. I’m impressed that you scored tickets for the Malaga game. I can’t imagine what you paid (unless you borrowed from a local contact). I have local contacts that help with tickets. 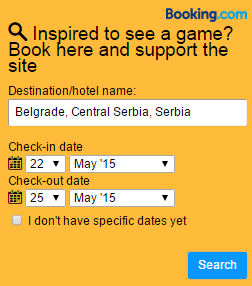 Let me know your plans for your third visit and we can maybe arrange a trip? That would be great, I plan to come over plenty of times next season so maybe we could organise something for then? Always good to meet up with new people and of course, see as many matches as possible! 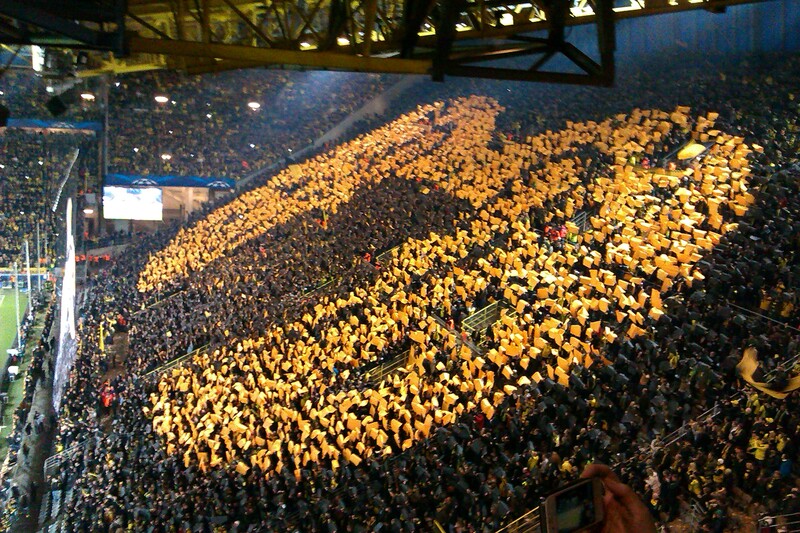 I’m hoping to come to the Schalke game next season and I’d also like to experience a BVB away game, although I’m sure tickets would be difficult most of the time. you shouldnt visit the game against the suburb of Gelsenkirchen. The athmosphere is mostly very aggressiv and the games often poor. Wonderful article, Ben. Loved to read! Thank you. Goosebumps all over again. Every blog post, every article I read about Tuesday night has the same effect. I have never, never cried after a football match. On Tuesday I did twice, tears of desperation and that tears of pure joy. Minutes of my life are gone, in which I probably just screamed at the top of my lungs. This night was what football is about, with all its injustices, pure emotion and twisted turns. When we left the stadium, high on adrenaline and happiness, there was a family of Málaga fans standing there, with two young sons, both of whom crying desperately, it almost broke my heart. Only in that moment did I truly realize that our joy was the other side’s utter despair – it increased my utmost respect for the Málaga fans and team post-match. Superb support, they will certainly by missed next year. Couldn’t agree with you more Ina, this game was the perfect representation of why football is so brilliant, and also so cruel. I think it’s unlikely I’ll be able to attend the Semi-Final or the final if BVB get a good result in Madrid, but in a way it doesn’t matter, I have already witnessed the game of a lifetime. To use another song quote, they took something perfect, and painted it red. I will be back at CCFC one day as they still have a place in my heart, but I’m afraid I can’t watch them in this current form, Premier League or not. The best match I ever attend will be the next time I watch Cardiff, as it will mean the rebranding nightmare is over. it is Friday, May 24th – the day before the CL Final in London. 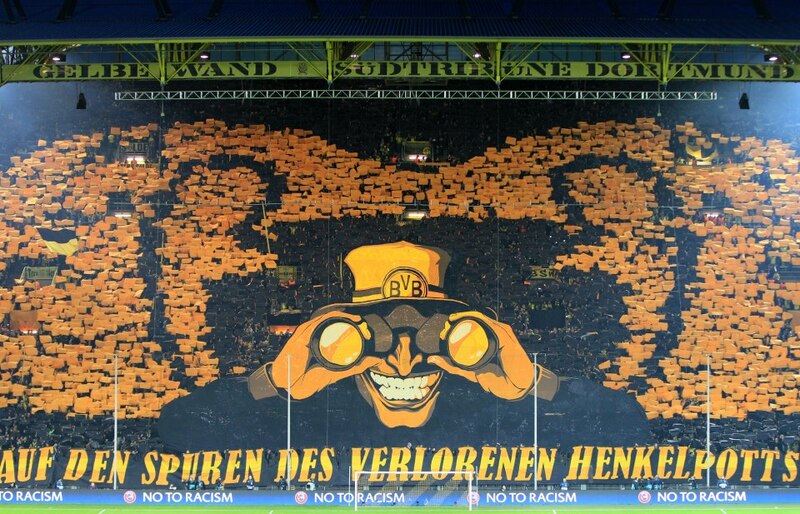 This will be the first CL game I miss this season, but I will travel to Dortmund, watch it in the Westfalenhallen and hope to see the players on Sunday. There is nothing planned if they do not win, but I could not care less. I am quite unable to work already and have come back to your blog again, and all the emotions are back from the games from the whole season. So thanks for your blog, and I hope you’ll return next season to Dortmund (or watch them away) for us to get the chance to have another report. Btw one minor thing in the Malaga-report: it was Hummels who came in and Gündogan who was replaced. The reason (though admittedly a strange exchange at first glance) was to throw finetuning to the wind and allow the best providers of precise long balls (Hummels and Sahin) to do just that and release the tall defenders Subotic and Santana into Malaga’s box for headers. I’m glad I was able to help you a tiny bit with the nerves before tomorrow! I will be in London for the final, but sadly I do not have a ticket so unless another miracle happens I will be watching on a big screen with your brilliant fans. I am certainly going to be back next season as many times as I can. Once you experience the magic of BVB, it is difficult to think of anything else. I’m hoping to go to my first away game next season, and I very much hope I do so to watch the champions of Europe. But whatever happens tomorrow night, simply having the chance to watch such a magnificent football club is a victory in itself. The UK is behind you! Really glad you enjoyed it! Still rate this as the best night of my life. 26,483,382 and a half. Roughly. 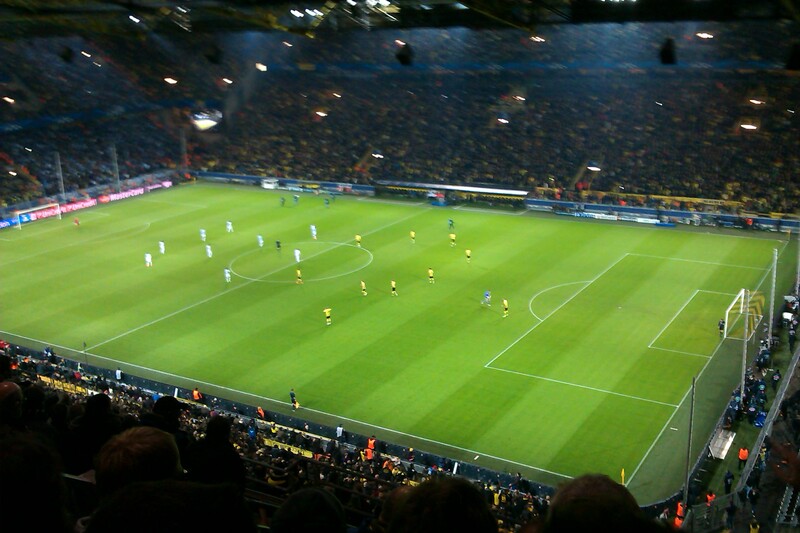 I watched this game in a bar in Köln (fair few BVB fans there it seems) when I was in Germany in April. When the final whistle blew at the end, a grown man who looked like he was on his way back from work took off his glasses because he was crying and just left. One of the greatest games in UCL history. The fact that Dortmund didn’t win it stung for me, but after Bayern beat Barca 7-0 on agg it seemed won already. Haven’t missed a Bundesliga game this season though. Great read as usual. Read this from a google search in preparation for my trip to Dortmund in December…it wasn’t until the very end that I realise it’s written by our very own ‘Dudders’!! (I’m a CCMB regular (we miss you)). Fantastic read!! Remembering watching this match on TV, I didn’t even spare a thought for how emotionally crazy the Südtribune must’ve been on that night!! THIS IS A RUE LIFE STORY OF A MIRACULOUS WATER AT WEST AFRICA NIGERIA IN KEBBI STATE, COMMUNITY STRONG MUDDY STREAM THAT HAS A HEALING POWER OF ALL KIND OF SICKNESS AND PROBLEM.” A WOMAN WHO WAS BLIND RECEIVED HER SIGHT AFTER SHE WASHED HER EYES WITH THE WATER. ALSO A MAD MAN WAS BROUGHT TO THE STREAM, AND HE BECAME NORMAL AFTER HE WASHED WITH THE WATER” TO CONFIRM THIS A TRUE LIFE STORY AND IT’S REALITY, YOU CAN GOOGLE THE ( THE NATION NEWS, SATURDAY, FEBRUARY 8, 2014, PAGE 13 TO 15…VOLUME.07 NO.2753) JUST TYPE = THE NATION NEWSPAPER IN NIGERIA AND GO TO THEIR FEBRUARY 8, 2014 NEWS PAGE 13 TO 15 =. IF YOU NEED MORE DIRECTIONS OR INFORMATION ABOUT THIS WATER YOU CAN EMAIL ME VIA ogechris28@yahoo.com.PLEASE SEND THE INFORMATION ACROSS THE GLOBE FOR THE BENEFIT OF OTHERS. THANKS.